This summer industry champions worked tirelessly to support raising awareness for a bill that addresses Reid Vapor Pressure (RVP) limits on E15. That bill — S. 517, the Consumer and Fuel Retailer Choice Act — was considered before the Senate Environment and Public Works Committee in June. After that hearing, Senate and industry champions determined that additional time was needed to increase bipartisan support for S. 517. Industry representatives are now convening meetings to determine the next steps to eliminate market barriers enjoyed by the fossil fuels industry. This exercise allowed us the opportunity to have a valuable discussion around the importance of moving to year-round E15 sales. We were able to activate a group of biofuels champions in the Senate, including Senators Joe Donnelly (D-Ind. ), John Thune (R-S.D. ), Joni Ernst (R-Iowa), Deb Fischer (R-Neb.) and Chuck Grassley (R-Iowa). “While we didn’t expect to reach the goal line, we nevertheless had a number of first downs and are closer to scoring than when we started,” said Rob Walther, Vice President of Federal Advocacy, POET. POET submitted detailed comments to the Environmental Protection Agency (EPA) as part of the public comment period. The following points are among the most critical to our argument that EPA must modify its final proposal. In particular, we focused on showing that EPA is underestimating cellulosic production and that the volumes called for under the RFS in 2018 must increase. 1. EPA’s new methodologies substantially and systematically underestimate cellulosic production. 2. There is no basis to use the general waiver to reduce the total renewable volume requirement due to inadequate domestic supply of renewable fuel. 3. 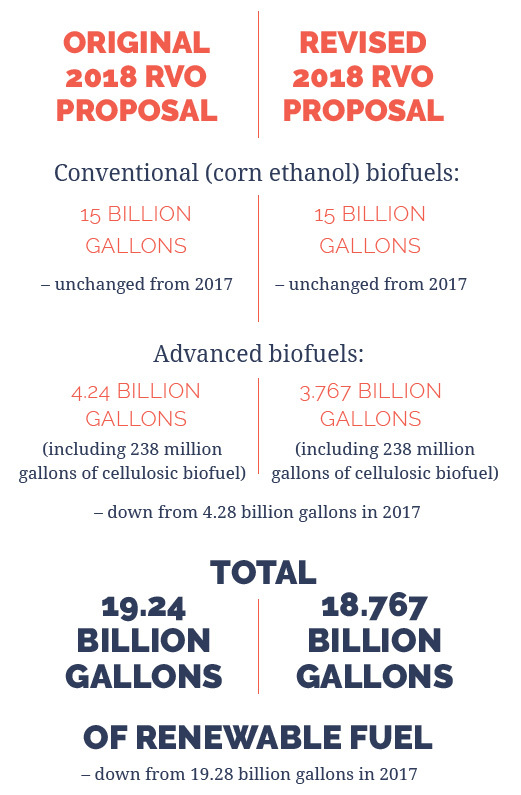 EPA should also account for liquid cellulosic biofuel volumes that will or will likely result upon EPA’s approval of pathways involving corn kernel fiber conversion. 4. Changes to the cellulosic waiver credit program are necessary to further Congress’s goal of promoting cellulosic biofuel. Note: Cellulosic waiver credits are credits that obligated parties may purchase to show compliance with their statutorily required cellulosic biofuel obligations, rather than by purchasing cellulosic biofuel renewable identification numbers, or RINS, which the EPA uses to track renewable fuels. Currently, EPA offers too many credits to obligated parties and gives them a pathway to avoid purchasing any cellulosic biofuel. 5. There is no basis to use the general waiver to reduce the total renewable volume requirement due to severe harm to the economy or environment. The U.S. Environmental Protection Agency (EPA) has made a proposal that, if implemented, would roll back the growth of homegrown biofuels. On Oct. 4, the EPA published a revised proposal in the Federal Register that could further reduce 2018 blending obligations under the Renewable Fuel Standard (RFS). This opened a fifteen-day public comment period that ended Oct. 19. The revised proposal contains a reduction in 315 million gallons of biodiesel, which translates to a reduction of 473 million gallons in advanced biofuels and the total amount of renewable fuel. POET and industry groups including Growth Energy and the National Biodiesel Board spoke out against the EPA’s actions. “These proposals would stop in its tracks any progress biofuels have made for fuel prices, public health, the environment and national security over the last decade,” said POET CEO Jeff Broin. Under statute, the EPA is required to issue a final rule for 2018 RVOs by Nov. 30. A public comment on the EPA’s initial proposal period ran from July 21 to Aug. 31. POET engaged team members, producers and other stakeholders to submit personal, handwritten comments to the EPA in an effort to share why the biofuels industry is important to rural America and our environment. Some examples of these comments are listed below. TERI KRUSE, SIOUX FALLS, S.D.